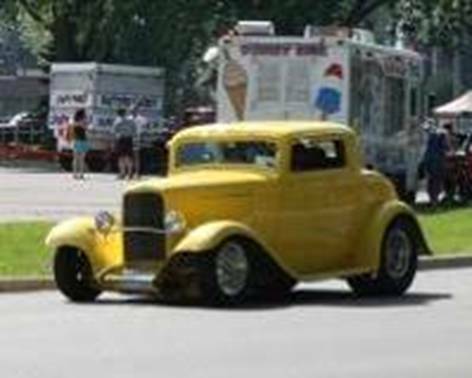 If you want to know the definition of “impossible,” try missing Jim Murphy’s car at a show: his 1932 Ford will undoubtedly be the brightest shade of yellow there. It’s a long way from the vehicle he originally wanted, though, which was a helicopter. When it came to collector cars, Jim preferred Corvettes, and his first one was a 1972. “I took it to Nurse Motors for a paint job, and they took it for a road test,” he says. “I don’t know why, but they took it for a drive and somebody clobbered it. When I got the car back, I could lift the back of the body off the frame. I turned around and got a 1973, and then I bought a 1977. I put side pipes and Thrush exhaust on it, and it was a nice car.” Also travelling through his garage over the years were another 1977 Corvette and a Camaro Z28. Alberta’s oil boom beckoned and Jim, who by this time had finished his apprenticeship and was working on dump trucks, went to Fort McMurray in 1981. There he bought another Corvette, this time a new one. He also indulged his interest in helicopters by helping a friend build one from a kit, intending to train and get his pilot’s licence in it. Unfortunately he returned to Ontario after he finished building the little chopper but before he could start lessons. His friend also owned a Model A pickup truck, and Jim caught the hot rod bug. He returned to Ontario and worked for J&F Trucking for a year, which is where he met Sharon Karn. They’ve been together for 22 years and their family includes Sharon’s son Phil, his wife Corinna and their sons Ethin and Liam. He and his brother Rick thought about joining Country Car Club. “We went over and checked it out, but for some reason we didn’t join up,” he says. “I don’t remember why. But Rick went to Motor City on his own, and I joined up six months later in 1996. His favourite event is Autofest, specifically when the cars start coming in on Saturday and Sunday mornings and he can reacquaint himself with friends he hasn’t seen for a year. “It’s like a long distance family that you only see at reunions. You get to catch up on each others’ lives and have a laugh or two.” He also enjoys watching and waving at the procession of cars at the end of the show on Sunday night. It gives him a chance to maybe pick up a few ideas for future car-making ventures.